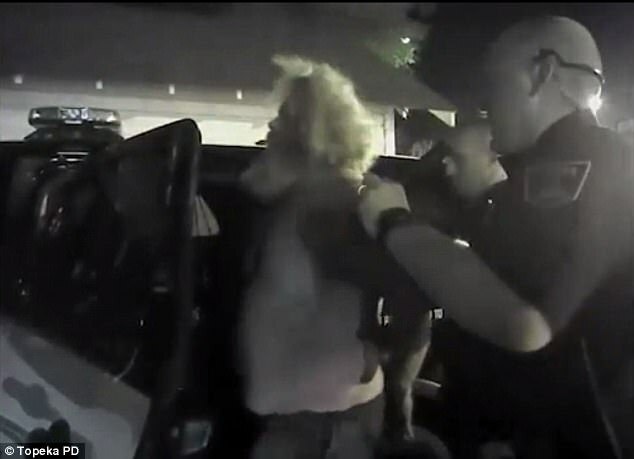 Authorities in Kansas released police body cam footage which shows officers unlawfully arresting and beating an innocent man, it was revealed on Friday. The video shows three Topeka police officers confronting a man smoking a cigarette outside his home one evening in September 2014. The officers initially suspected he had made a 911 call, according to The Kansas City Star. The man, Arthur Morris, is seen in the video denying he had called 911. He also denied that he and his partner with whom he was living, Jeanie Becerra, were yelling at each other, which supposedly prompted neighbors to call 911. Nonetheless, an officer who was later identified as Jeremy Carlisle-Simons, is seen in the footage grabbing Morris, wrestling him to the ground, and beating him. 'I didn't do nothing wrong,' Morris is heard in the video yelling to Carlisle-Simons as he is being beaten. Towards the end of the footage, Morris is taken away from his home in handcuffs. He asks where they are going. 'You're going with me,' an officer says. 'OK. Where am I going?' Morris asks a second time. 'Wherever I take you,' the officer says. After the violent arrest, Morris and Becerra were convicted in Topeka municipal court of assaulting an officer, disobeying an officer, disturbing the peace, and interfering with law enforcement. After the body cam footage surfaced, the judge vacated the sentences. Morris was given a $40,000 settlement from the city. Becerra received $10,000. Even though the video proved that the couple was innocent, police did not release it in time for it to make a difference in their trial. After the couple's convictions, Luther Ganieany, a Topeka police legal advisor, wrote a letter to the judge. Ganieany asked the judge to reconsider the convictions based on the video. He also wrote that the video contradicted testimony given by police officers. Ganieany wrote that the video shows the officers had no reasonable suspicion to confront Morris at his home. He also noted that after someone dialled 911, the dispatcher called the person back at his home. It was clear that there was no emergency. What made the conviction even more problematic was the fact that prosecutors did not turn over the body cam footage to the defense – as they are required to do by law. After the Shawnee County District Attorney reviewed the body cam footage, it declined to prosecute any of the officers, Ganieany wrote. Two of the three officers returned to work while Carlisle-Simons, the officer who wrestled Morris to the ground and beat him, eventually resigned. The Topeka Police Department has a history of misconduct by its officers. Since 2010, the city has paid over $400,000 in total settlements to individuals who claimed to have been victimized by local police, according to the The Topeka Capital-Journal. The most high profile case of alleged police misconduct took place earlier this year, when two Topeka police officers shot and killed 30-year-old Dominique White. White was near Topeka's Ripley Park when officers responding to reports of shots being fired arrived at the scene. Police said that White, who was armed, was shot in the back while fleeing arrest. A death certificate indicates that White died of 'gunshot wounds of back' – leading the public to believe that he posed no threat. It took the family months of legal wrangling before authorities allowed White's father to view police body cam footage. 'Unacceptable behavior is not tolerated going forward,' interim Police Chief Bill Cochran told the Topeka Capital-Journal.